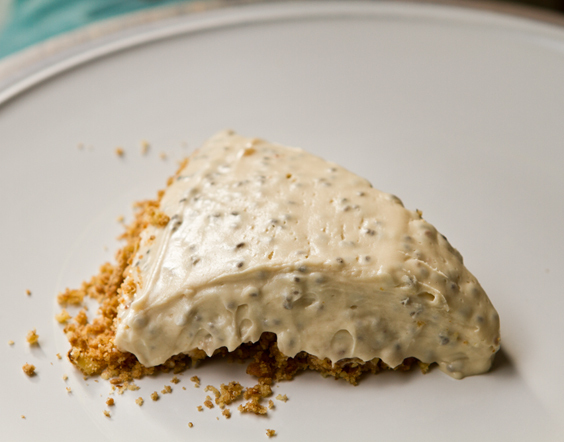 No-Bake Vegan Chia Cheesecake. Crumble Crust. 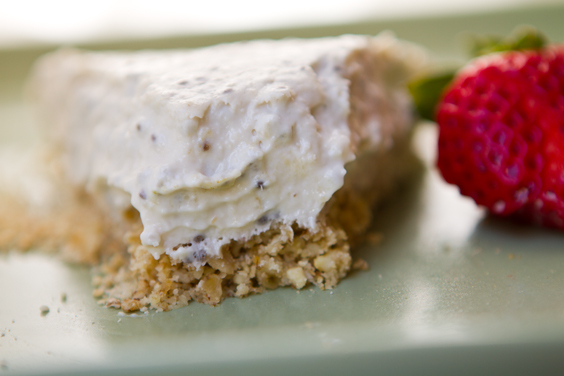 This No Bake Chia Cheesecake vegan dessert is cool and creamy with a thick, rich, "cream cheese" flavor. 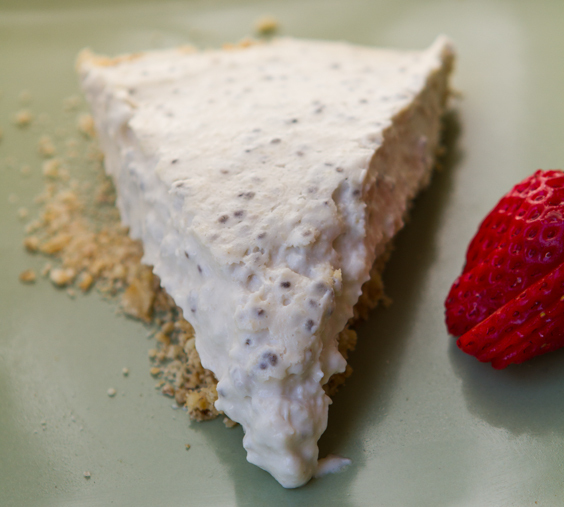 Each chia-studded slice has a mellow, cozy sweetness from the agave syrup - a hint of tart too. I like to call this a soft serve cheesecake because it has a silky texture that melts in your mouth - yet it still stands up to being sliced like a traditional cheesecake. The nutty oat crust is cheerfully healthy and rustic - with walnuts and oats. Comfort cheesecake. Ch-Ch-Ch-Chia. Sorry, I had to. Those healthy chia seeds not only add a boost of healthy omega fatty acids and fiber - but they help create a perfectly creamy-gelled texture that is slice-able yet pudding-like (in a good way.) Learn more about the magical thickening properties of chia here. 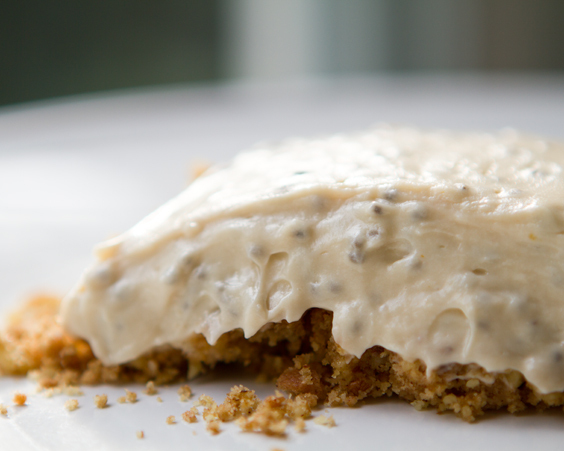 And FYI, since chia seeds are pretty flavorless and become soft when hydrated - you barely notice them in the cheesecake. 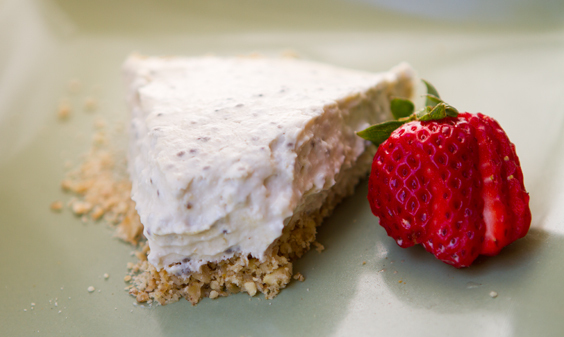 Dreaming of an easy, unique vegan cheesecake recipe? Here is mine.. This version had some added soaked raw cashews to the blend.. I've been obsessed with this recipe for the past week. Tweaking it. Changing it. Switching out the ingredients and testing the texture. I just love how easy this recipe is. And in the end you are left with an entire pie dish full of no-bake cheesecake. The components are pretty simple.. Cream Cheese. You will need two tubs. There are several vegan brands to choose from. Taste test your favorite as is and use that in the recipe. I find the Tofutti brand to be a bit on the dry and under-salted side of the spectrum. But it still makes a yummy cheesecake. Trader Joe's now has a vegan cream cheese too. It is super creamy and soft - silky. It works very well in this recipe. And there are other brands as well - like the rich and creamy Follow Your Heart brand. Sweetener. I like agave or maple syrup. You can use either one. Maple is a more defined flavor, and more expensive. Agave is more purely sweet. Tart. For the tart accent I have been playing around with either vegan plain yogurt or vegan sour cream. I prefer the sour cream - although both work quite well. Salt. I love pink salt in this recipe. Crust. I started out with a basic crushed cookie crust and started adding some walnuts to the blend in my Vitamix. I loved them. Slowly, I moved towards a crust that was 100% crushed walnuts and whole rolled oats. It has a healthier flavor than the cookie crust - but I liked it. For a baked crust - I add a tablespoon of melted vegan butter and then bake the crust for about ten minutes to crisp it. If you don't bake the crust your flavors (like the oats and nuts) will be a bit more bland and less nutty. 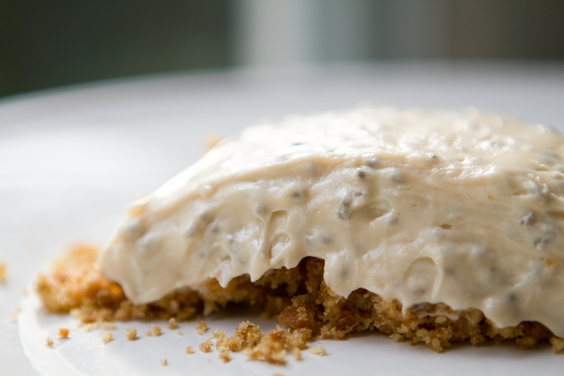 Having a raw crust makes for a more 'crumble' serving - rather than a true cheesecake slice. Topping. I adore a basic no-cook blueberry topping. I simply use my Vitamix to puree some frozen (or fresh) blueberries with a splash of soy creamer or soy milk and drizzle or sweetener for a lovely topping. Added Fat/Firming. I loved adding virgin coconut oil (VCO). If you have ever placed virgin coconut oil in the fridge you know that it firms up - as hard as a rock - perfect for firming your cheesecake without baking! The VCO really helps with the overall silkiness too. The virgin coconut oil ingredient is a must to achieve my slice-able texture. If you really don't want to use VCO, try vegan butter or tweak the recipe to infuse some agar agar into the mix. Trader Joe's now sells VCO at a good price. The Whole Foods brand is a great option too. So after much tweaking, here is the recipe I like best..
optional: add in 1/2 cup soaked and drained cashews for a more rustic texture. I did this for the cheesecake version in photo at very top. 1. In a Vitamix of food processor, add the crust ingredients. Pulse until a smooth crumble forms. Pour into bowl and toss with melted butter. 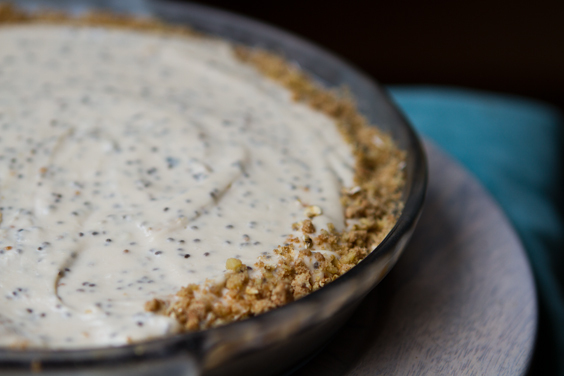 If making raw crust, add directly to your serving pie dish. For baked crust (recommended) add the mixture to a well greased (with vegan butter) pie dish. Bake at 400 degrees for ten minutes. Remove from oven and set aside. 2. You can use either a Vitamix or a simple hand mixer to blend the filling. Add all cheesecake filling ingredients to bowl or blender. Mix on med-high until fluffy and creamy. Do a taste test. Adjust salt and sweetener if needed. Note: make sure to fully 'melt' the coconut milk before blending! You may need to warm in microwave or set out on counter to bring to a soft blendable state. 3. Pour filling into crust. Place in fridge for about 2 hours to fully chill before serving. For quicker chilling you can place the cooled-slightly pie dish in the freezer for first 20 minutes. 4. Serve chilled. 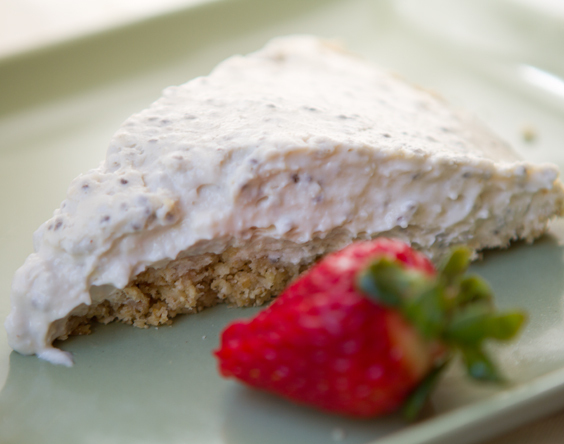 For more firm slices, place cheesecake dish in freezer for ten minutes right before serving. 5. 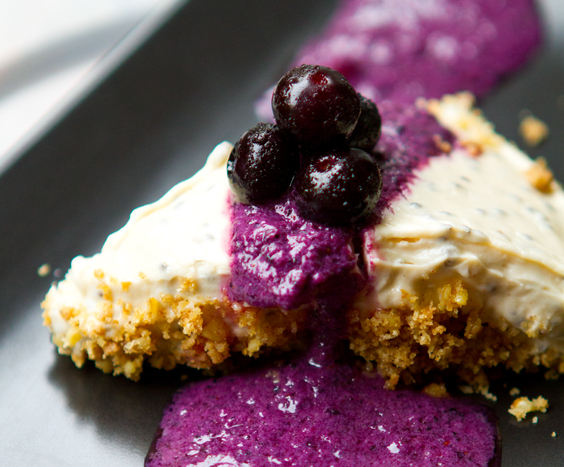 If adding blueberry topping - blend ingredients and chill in fridge until ready to drizzle over top cheesecake.